Lace has been made in the Honiton for the past 400 years. Allhallows Museum is keen to keep the tradition alive in the 21st century. 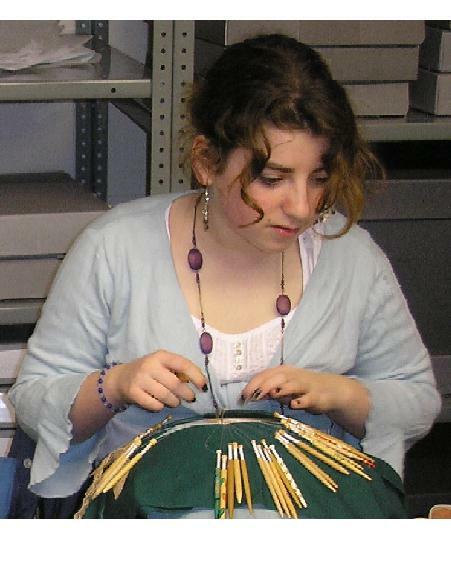 Volunteers demonstrate the craft of Honiton lace making (Monday to Friday) during the months of June, July and August. Under the tuition of Mrs Daphne Lee, Honiton lace making classes are held in Allhallows Museum on Monday evenings. Q. What is Honiton Lace ? Honiton lace is a very fine English hand-made bobbin lace which has been made in the East Devon area. Q. Why is it called Honiton Lace ? Possibly because Honiton was the major lace producing town and the staging point for London, hence the lace was said to come from Honiton. Q. For how long has it been made? Accurate records exist from the early 17th century. Q. Where did the industry come from? Lace making probably spread throughout Europe from Italy. Q. What was it used for? Traditionally, lace was always used as a fine decoration on clothing - collars, edgings, cuffs, veils, trimmings, and handkerchiefs. Antique lace is still used for this, but now it is also used as a framed decorative ornament around the home. Q. How is it made? Honiton Lace is made by hand in a miniature weaving process: the loom being made from pins placed through a pattern on a straw pillow. Very fine threads held on bobbins are woven back and forth to build up the pattern. Variations are created by the use of different stitches within the pattern. Q. How long does it take to make? One square centimetre of lace could take up to 5 hours to produce. Large pieces such as collars or handkerchiefs could have taken up to 1,000 hours. Q. Who made the lace? It was a cottage industry, with the majority of lace being made in the homes of the workers, who were often the wives of poorly paid labourers and fishermen. Often these people were controlled by shop owners, who employed teams of workers to produce the lace for sale in London and other markets. Q. Where is the Honiton Lace factory? There is no factory and never has been. Imitation lace was made by machine at Heathcotes in Tiverton. Q. Who makes the lace now? There is virtually no Honiton Lace made commercially now: it would be far too expensive to produce it because of the time involved. Many thousands of people from all over the world make lace today as a hobby. Q. Is it easy to learn to make? If you have patience and time, can follow instructions and diagrams, use good equipment and have access to someone who knows how to help - then yes it is.